A staked tomato field in the Piedmont of North Carolina. Fieldgrown tomatoes lead retail market sales in the U.S. This comprehensive resource was developed from research and Extension projects conducted at 12 land-grant universities, including NC State. The handbook contains everything tomato growers need, including which variety to plant, planting dates, fertilizer recommendations, cover crops selection and conservation tillage options, pesticide selection, fertigation, plasticulture, postharvest handling, alternative pest management tools and more. All of the information a grower needs to start producing staked tomatoes is in this guide from N.C. State University. Get advice on choosing cultivars; budget expected costs; learn about equipment; discover pest management practices; and consider marketing methods that will help sell staked tomatoes. Includes production basics in a nutshell including varieties, field preparation, pest control and harvest expectations. 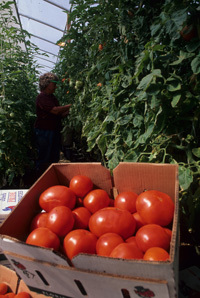 Don’t miss the 10 tips for successful tomato production. A quick reference covering the production practices for tomatoes grown for processing. Selecting the appropriate varieties and training workers to harvest fully mature fruit are two aspects that differentiate growing for the processing market and growing for the fresh market. The float system may be a less labor-intensive alternative to conventional tomato seedling production. This publication discusses the float system, its potential benefits and proper nutritional practices. Tomatoes have shown significant increases in earliness, yield and fruit quality when grown on plastic mulch. This publication outlines the advantages and disadvantages of plasticulture. Fertigation refers to injecting fertilizer into a drip irrigation system for field crops. Nutrients can be applied to plants in the correct dosage and at the time appropriate for a specific stage of plant growth. Tomato plants have two general growth habits: determinate and indeterminate. This publication will help identify the growth habit and provide type-specific spacing and training information. The following resources are not North Carolina-specific; however, they contain general information that North Carolina growers may find valuable. Be sure to recognize differences in climate, disease pressure and seasonality as you review this material. For cultural information such as planting dates and pest control options for North Carolina tomato production, contact your local NC State Extension agent. Commercial tomato production requires a high level of management, large labor and capital inputs and close attention to detail. This publication looks at the three distinct production areas in Tennessee. Tomato, pepper and eggplant are commonly grown using plastic mulch and drip irrigation. Extension personnel from Mississippi State University maintain a list of FAQs for commercial vegetable producers. This is a comprehensive resource for Florida producers. Scope of information includes varieties, integrated pest management and cost considerations. The Fresh Market Tomato Breeding Program emphasizes the development of improved, disease resistant cultivars adapted to production in North Carolina and surrounding areas. The program has just published four research papers on trial breeding varieties.